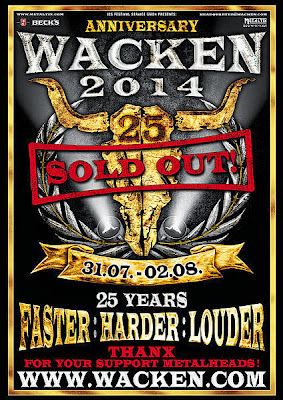 Since the last announcement, there have been two announcements for Wacken. One detailing a very special show and the 13 band announcement made at Hamburg Metal Dayz 2013. This blog will look at the announcements. This time last year, Wacken announced 13 bands for the festival. One of the bands they announced in that batch was Rammstein. Suffice to say; when I knew this announcement was coming, I was looking forward to it, eagerly anticipating if the main headliner would be a part of this announcement. Anyway, the bands! Vreid/Windir/Ulcus - I’m not overly familiar with the 3 bands in question (I’ve listened to a bit of Vried as they played Wacken 2011) but this show is a celebration of the 3 bands. I think if I understand the billing correctly, the current members of Vried were all in the other bands as well and they will be joined by special guests to play songs from all 3 bands covering 20 years of material. I’m not 100% on the specifics, but it certainly sounds interesting enough! Heaven Shall Burn - Despite having seen this band at Wacken in 2011, they were on my wish list for next year’s festival. Put simply, I thought they were superb and want to see them live again. I was seriously excited when I found out they were due to support Rise To Remain on their UK tour, but then announced (after I bought a ticket) they wouldn’t be at the Portsmouth or Birmingham dates (I would have been at the Portsmouth date) so that was annoying. Anyway, I’m very happy with this announcement. J.B.O - The Wacken website has described them as “German cult comedy metal band” which I suspect not being a German speaker, might be somewhat lost on me. Devin Townsend Project - I’m really happy with this announcement. Never managed to get round to seeing Devin Townsend live (other than once with Strapping Young Lad) so I’ll do my best to watch his set. Sodom - Another band from Wacken 2011 but another booking I am happy with. I seem to recall really enjoying their set in 2011 so will give them another watch. Nothing wrong with a bit of Thrash Metal here and there. Onkel Tom - Given that Sodom are playing, it makes sense for Onkel Tom to be playing (given the presence of Tom Angelripper in both bands). Now I think about it, I wouldn’t be surprised if he turns up with Skyline as well. Anyway, I caught some of their set in 2011 and thought it was alright. Might do so again this time around, clash depending. Decapitated - I’m quite pleased with this announcement although given that they are supporting Lamb of God on their UK tour (which I’ll be going to), it wouldn’t be the end of the world missing them. I missed them in 2012 as they were playing in the tent and clashed with someone else I wanted to see on one of the main stages. For The Imperium - I’m not really sure what to make of this band. I like some of the stuff I’ve heard but other stuff not so much. The Ocean - This booking gave me an excuse to check out their new album (which I’ve seen people be very complimentary to online). I haven’t played the whole thing through yet but I can see why people like this album. I hope to see this band. Endstille - This band do nothing for me. They remind me of Mayhem. That reminder is not a compliment. Torment - This band will be playing a 30th anniversary show at Wacken 2014 which will be cool I imagine. I listened to some of their stuff which I enjoyed. Again, there is nothing wrong with a bit of thrash metal. However, with now Kreator, Sodom and Torment playing, I somehow feel Death Angel may not do so. Alas. Masterplan – This is another band that I have briefly checked out following their announcement. I quite like what I have heard thus far. A Pale Horse Named Death - I am very happy with this announcement. Mostly because I had never heard of this band so I went to check them out and they are very good. At this early stage, they might be a must watch. All in all, I would say this is a fairly decent announcement, with a few acts I hope to see at the festival (including some bands I’ve not seen live before which is good). I would say this announcement is lacking in a huge hitter like the September announcements the last few years have had (Rammstein last year and Volbeat the year before – I guess Volbeat being a big hitter is subjective, but they did headline the Night to Remember and they’re one of my favourite bands so for me, big hitter). Looking at the Wacken Facebook page post announcement, there were a lot of people who, like me, expected to see a headliner announced in this latest batch. Wacken replied to a comment someone made essentially saying they have a great band confirmed as the headliner, but they are not allowed to announce it yet. Let rumours commence as to who that could be although that does all but confirm the Thursday will not be a black metal Night to Remember with Emperor and Vreid. 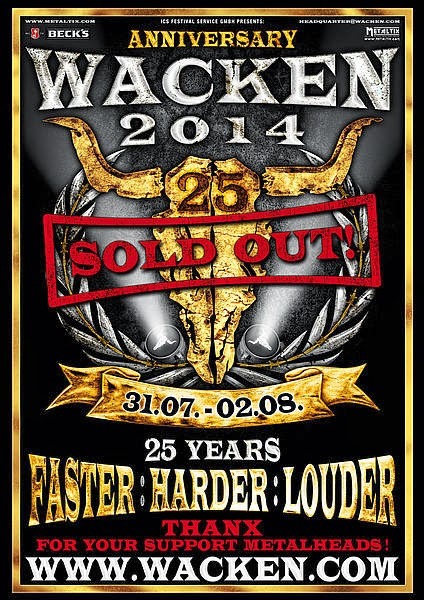 Good start Wacken; roll on December for another big chunk of the line up. Will we have to wait until December for the night to remember band? Hope not but we’ll see.